Here we collect articles about Derby. Please also check the Derby Wiki for smaller write-ups. Note: Some articles use the term "Java DB". Java DB is essentially the same as Derby: it is the bits distributed by Oracle as part of the Java Development Kit (JDK) based on the Derby bits. Note: Some articles use the term "Cloudscape". 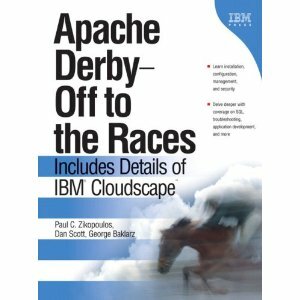 Cloudscape is the product name used by IBM before Derby was open sourced. There is also the now somewhat dated book "Apache Derby - Off to the Races"
(See also the Derby Tutorial). Derby is a 100% Java open source relational database, and you can't afford to ignore it. Learn why in this article. Apache Derby Database - Tutorial (by Lars Vogel) This articles explains how to install the Apache Derby database, how to start the Derby server, how to connect via Java to Derby and how to use the Derby command line tool to issue SQL statements. The installation of Apache Derby as Windows Service is also explained. This thorough introduction to Derby addresses installation, environment set up, building and executing an application with Derby embedded. Need a network database server that can handle multiple remote clients? There's no longer a need to spend megabucks. Stephen Morris explains how Derby can serve the needs of many remote clients via an open-source RDBMS. Do you need a simple database as part of an application upgrade? Derby is easy to use and program and combines high performance with a modest footprint. Stephen Morris tells you why database development is no longer the sole preserve of DBAs or data center IT people. Java DB Table Functions (Download Code and White Paper) (by Rick Hillegas) This white paper explores table functions, a feature introduced in Derby release 10.4.1.3. Rich and expressive, SQL is the world's most popular database query language. Table functions let you take SQL outside its traditional home in the RDBMS, setting SQL loose on data in the wild. A short, simple tutorial on how to use Apache Derby and LDAP. Java DB Security (by Rick Hillegas) Derby provides several ways to protect the correctness and privacy of your data as well as forestall accidental or malicious misuse of the database software itself. This white paper explains how to improve the database security of applications and machines which use Derby. There is a big difference in the behavior of a database when it is populated with a small amount of test inputs and when it holds a large amount of data. Usually, you would not address these database performance issues early in the development process, but when the time comes, you should take some action to ensure that the application is working correctly with large amounts of data. Working with the Java DB (Derby) Database [in NetBeans] (by the Netbeans team) This document demonstrates how to quickly set up a connection to Oracle's Java DB (which is based on the Apache Derby database) in NetBeans. Once a connection is made, you can easily begin working with the database in the NetBeans IDE, allowing you to create tables, populate them with data, run SQL queries, and more. SQuirreL SQL Client is a useful tool for browsing and manipulating SQL databases via JDBC. This paper discusses setting up SQuirreL to access Derby databases via the Derby Embedded Driver and Client Drivers with the 10.1 version of Derby. DdlUtils, an Apache DB subproject, provides utilities for creating and working with Database Definition (DDL) files and for exporting and importing data in XML format. Among other uses, DdlUtils makes it easier to migrate from one database vendor to another. This paper provides a simple example for using DdlUtils to migrate a database to Derby using the DdlUtils Ant tasks. Learn how to deploy Derby, based on the Apache Derby database, within desktop Java applications. The article uses the Address Book demo to show you how to work with Derby as an embedded database. This document demonstrates setting up the JPetStore 4.0 application to run on a J2EE Application Server using an embedded Apache Derby database as the persistence layer. Apache Derby is a small footprint, open source, relational database engine written in Java. It is ideally suited for use with J2EE and Web applications where reliability, portability, ease of use and low maintenance is important. Shows the steps required to embed Derby in a Tomcat version 5.5.12 Server and then deploy a copy of the iBATIS JPetStore application that utilizes a Derby database. Instructions for installing and configuring Derby for use on ColdFusionMX. Conclusion: "All in all, it was very easy to get Apache Derby to work with ColdFusionMX. ... I'm quite sure I'll be using much more of Derby in the projects I work on." This document provides details on how to configure and run Apache Derby with Red Hat Application Server. Provides a concrete example of using JPOX JDO to persist and retrieve data to and from Apache Derby. Java Data Objects (JDO) is a specification for persisting Java objects. This page summarizes the changes required to run the Torque 3.2 tutorial on Derby 10.1 using the Derby embedded JDBC driver. This wiki page documents various peoples' experience using Hibernate with Derby. How to use Derby with C-JDBC,an open source database cluster middleware that allows any Java application to transparently access a cluster of databases through JDBC.